Starch is a complex carbohydrate, specifically a polysaccharide, that is used by plants as a way to store glucose. After cellulose, starch is the most abundant polysaccharide in plant cells. In pure form, starch is insoluble in cold water. Animals and plants digest starch, converting it to glucose to serve as a source of energy. Starch is a major source of carbohydrates in human diets, and can be obtained from seeds, fruits, nuts, corn, potatoes, and so forth. In prepared form, starch (in particular cornstarch) is used in cooking for thickening sauces. Self-discipline is called for in eating food high in starch, such as refined cereals, breads, and pastas, since overconsumption of complex carbohydrates correlates with obesity and medical problems. Willett and Stampfer (2003) found an association between a high intake of starch from refined grains and potatoes and the risk of type 2 diabetes and coronary heart disease. In industry, starch is used in such purposes as the manufacturing of adhesives, paper, textiles and as a mold in the manufacture of sweets such as wine gums and jelly babies. While in general starch appears in plants as partially crystalline granules, from 5 to 200 µm in diameter, the exact size, shape and particle size distribution varies according to their plant source. For example, Sengbusch (2003) reports that starch grains from potato tubers have a diameter of 70-100 µm, that of the endosperm of wheat 30-45 µm, and that of corn endosperm 12-18 µm. Starch is common in the seeds, tubers, and roots of plants. In prepared form, starch is usually a white powder, and, depending on the source, may be tasteless and odorless. Carbohydrates are a class of biological molecules that contain primarily carbon (C) atoms flanked by hydrogen (H) atoms and hydroxyl (OH) groups (H-C-OH). As a polysaccharide, starch is a large polymer composed of a great number of monosaccharides, while monosaccharides, such as glucose, are the monomers out of which larger carbohydrates are constructed. 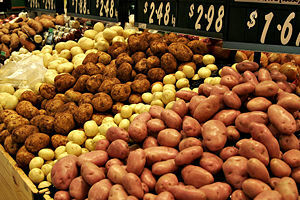 Starch is the major polysaccharide in higher plants used for storage of carbohydrates. The other major polysaccharide used in plant cells is cellulose, which is a structural polysaccharide. The major storage polysaccharide in animals is glycogen. The basic molecular structure of these are: (C6(H5O)10)n. As with cellulose and glycogen, starch contains the six-carbon sugar glucose as its single repeating unit. However, these three polysaccharaides differ in the type of bond between glucose units and the presence and extent of side branches on the chains. In granular form, starch occurs as both unbranched (linear) amylose and the branched (bushlike) amylopectin. Like glycogen, amylopectin has α-1,6 branches, but these occur less frequently along the helical backbone (once every 12 to 25 glucose units), producing longer side chains (lengths of 20 to 25 glucose units). Starch granules are generally about 10-30 percent amylose and 70-90 percent amylopectin. Starch readily binds water, and when that water is removed, polysaccharide chains aggregate, forming hydrogen bonds. This bonding is what causes bread to become hard and stale. The addition of water and gentle heat softens the bread by separating the polysaccharide chains. Since branching limits the number of hydrogen bonds that can form between molecules, solid deposits of the highly-branched glycogen are more compact than those of starch. Starch is insoluable in cold water. In hot water, amylose forms a colloidal dispersion, but amylopectin is completely insoluable. While mammals cannot use cellulose (such as grass) as food, they can digest starch (such as in potatoes). Commonly used starches around the world are: arracacha, buckwheat, banana, barley, cassava, kudzu, oca, sago, sorghum, sweet potato, taro, and yams. Edible beans, such as favas, lentils, and peas, are also rich in starch. As an additive for food processing, arrowroot and tapioca are commonly used as well. When a starch is pre-cooked, it can then be used to thicken cold foods. This is referred to as a pregelatinized starch. Otherwise starch requires heat to thicken, or "gelatinize." The actual temperature depends on the type of starch. A modified food starch undergoes one or more chemical modifications that allow it to function properly under high heat and/or shear frequently encountered during food processing. Food starches are typically used as thickeners and stabilizers in foods such as puddings, custards, soups, sauces, gravies, pie fillings, and salad dressings, but have many other uses. Gummed sweets such as jelly babies and wine gums are not manufactured using a mold in the conventional sense. A tray is filled with starch and leveled. A positive mold is then pressed into the starch leaving an impression of one hundred or so jelly babies. The mix is then poured into the impressions and then put into a stove to set. This method greatly reduces the number of molds that must be manufactured. Clothing starch or laundry starch is a liquid that is prepared by mixing a vegetable starch in water (earlier preparations also had to be boiled) and is used in the laundering of clothes. Starch was widely used in Europe in the sixteenth and seventeenth centuries to stiffen the wide collars and ruffs of fine linen that surrounded the necks of the well-to-do. During the nineteenth century and early twentieth century, it was stylish to stiffen the collars and sleeves of men's shirts and the ruffles of girls' petticoats by applying starch to them as the clean clothes were being ironed. Aside from the smooth, crisp edges it gave to clothing, it served a practical purpose as well. Dirt and sweat from a person's neck and wrists would stick to the starch rather than fibers of the clothing, and would easily wash away along with the starch. Chefs have traditionally worn starched uniforms because the starch acts as a fire retardant. Then, after each laundering, the starch would be reapplied. Starch glues are widely used in the bonding of paper, wood, and cotton. Iodine is used in a common test for starch. In the presence of iodine, a deep blue or blue-black color is formed. It is the amylose granules that are responsible for the color formation. Since iodine does not easily dissolve in water, the reagent is made by dissolving iodine (I) in the presence of potassium iodide (KI), making a soluble complex (I-KI). If amylose is not present, the color remains orange, yellow, or brown. If amylose is present, the color changes to deep blue or blue-black. Neither amylopectin, cellulose, nor simple sugars react. This reaction is easiest when the cell walls have been destroyed, so that the iodine solution can penetrate into the cell, and when the starch granules are swollen. Thus, heating is useful in the test. The details of this reaction are not yet fully known, but it is thought that the iodine (triiodide|I3− and I5− ions) fits inside the coils of amylose, the charge transfers between the iodine and the starch, and the energy level spacings in the resulting complex correspond to the absorption spectrum in the visible light region. A 0.3 percent w/w solution is the standard concentration for a dilute starch indicator solution. It is made by adding 4 grams of soluble starch to 1 liter of heated water; the solution is cooled before use (starch-iodine complex becomes unstable at temperatures above 35 °C). This complex is often used in redox titrations: in presence of an oxidizing agent the solution turns blue, in presence of reducing agent blue color disappears because I5− ions break up into iodine and iodide. Under the microscope, starch grains show a distinctive Maltese cross effect (also known as “extinction cross” and birefringence) under polarized light. High fructose syrup, made by treating dextrose solutions to the enzyme glucose isomerase, until a substantial fraction of the glucose has been converted to fructose. In the United States, high fructose corn syrup is the principal sweetener used in sweetened beverages (see high fructose corn syrup). Bornet, F. R. J., A. M. Fontveille, S. Rizkalla, P. Colonna, A. Blayo, C. Mercier, and G. Slama. 1989. “Insulin and glycaemic responses in healthy humans to native starches processed in different ways: correlation with in vitro α-amylase hydrolysis.” American Journal of Clinical Nutrition 50: 315-323. Sengbusch, P. V. 2003. The Structure of a Plant Cell. Access date: December 6, 2006. Smith, A. M., S. C. Zeeman, D. Thorneycroft, and S. M. Smith. 2003. “Starch mobilization in leaves.” Journal of Experimental Botany 54 (382): 577-583. Willett, W. C, and M. J. Stampfer. 2003. “Rebuilding the Food Pyramid.” Scientific American (January, 2003). Access date: December 6, 2006. This page was last modified on 29 August 2008, at 15:44.